thank you to all involved, we couldn’t have done it without you! 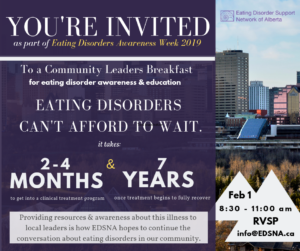 EDSNA hosted several events in the city of Edmonton, and we were so happy to meet so many of you! Scroll for more info, or email info@EDSNA.ca with any questions you might have. Don’t forget to follow @EatingDSNA on all of our social for pictures, or tag us if you have photos you’d like to share – we’d love to see them! 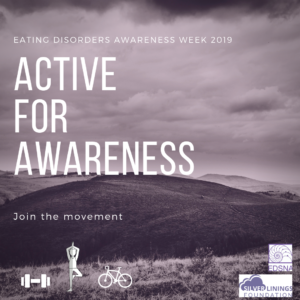 Our kickoff to EDAW 2019! Please note, the breakfast is by invitation only, but the landmarks will be lit up across downtown! Come join us for a blacklight yoga class – wear your neon gear, paint yourself in neon paint, and enjoy a fun, all-levels yoga session led by studio owner Jason Morris. Soundtrack provided by Zephyr. Come spin a Sunday afternoon away with us at YEG Cycle-124street. While you might be too warm in a full polyester banana suit, wear whatever makes you happy and ride to an upbeat, body-positive playlist. Class led by Taylor Pitman, a current EDSNA volunteer. Pretend you’re Van Gogh and join us at Cafe Blackbird for a collaborative art project. 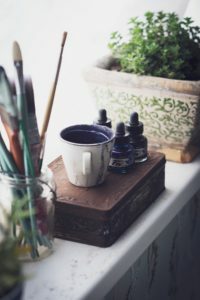 There will be live music, other members of the EDSNA community, and a host of art supplies to create a beautiful addition to this year’s EDSNA EDAW masterpiece. 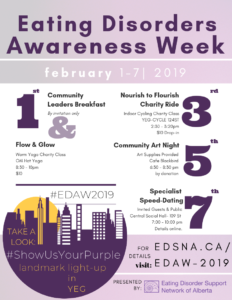 It’s the last day of EDAW, and we are hanging out at Central Social Hall. 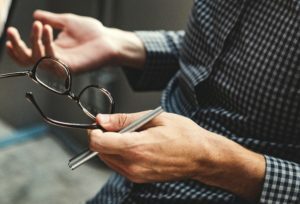 Come meet and ask questions of the amazing healthcare professionals in our community, have a drink with friends, and enjoy a space full of like-minded people. Looking forward to seeing you there! Cost: FREE entry, snacks provided. Drinks available for purchase. 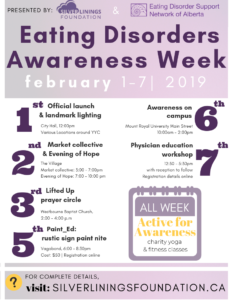 Eating Disorders Awareness Week in Calgary is hosted by several amazing community organizations. 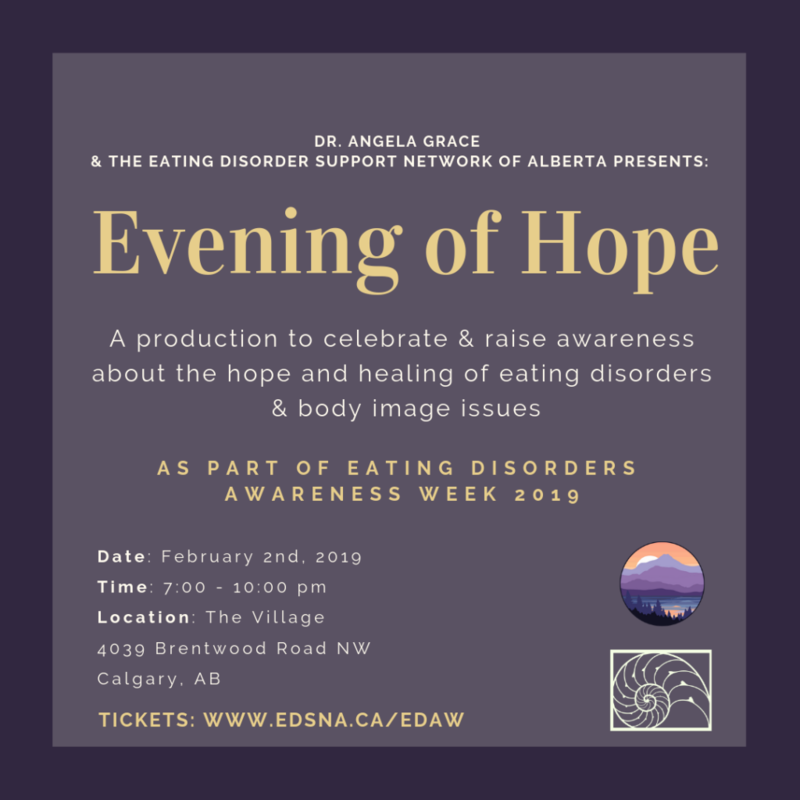 We definitely encourage you to see what else went on in Calgary, but these are the events hosted by EDSNA. Join Dr.Angela Grace and EDSNA for an evening of visual and performing arts. This magical evening will feature artists of different mediums, all celebrating recovery, hope, and healing. To purchase tickets, please follow the link or click the poster – we’d love to see you there! Stop by the booth at Mount Royal University to spin the “Wheel of Wellness” at the Awareness on Campus event. Answer trivia questions from our amazing volunteers, and win some awesome EDSNA swag! 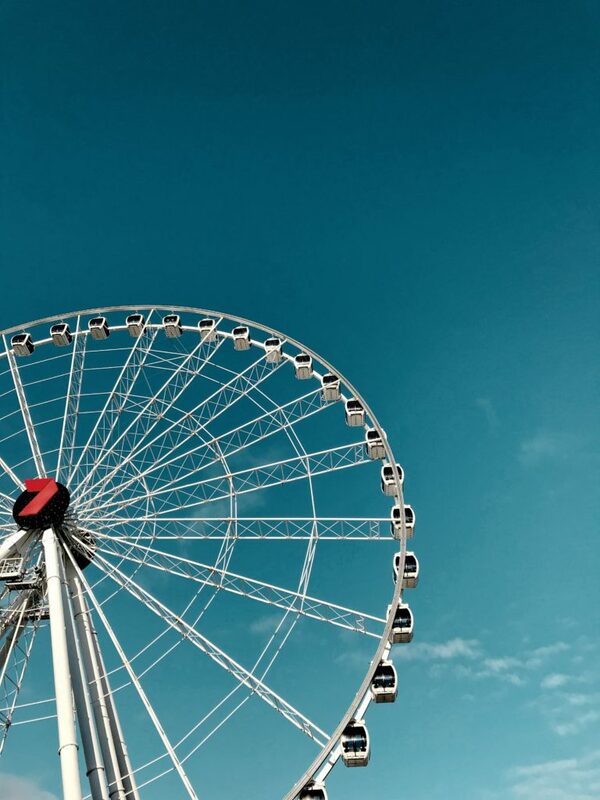 Disclaimer: “Wheel of Wellness” is not the size of a ferris wheel.